Phenomenal following..More than two million people across the globe religiously follow him on microblogging site Twitter, giving Tibetan spiritual leader the Dalai Lama an unprecedented reach. The Dalai Lama has outstripped the following of many icons of cinema and sports, as he disseminates his teachings, speaks on various issues concerning his people and even reaches out to the Chinese people. “To control negative physical and verbal actions, it is necessary to get at their root, the mind, and tame it,” is a spiritual lesson from him on Twitter. Over 2 million followers on 1.40 p.m. Monday, the Dalai Lama’s Twitter account @DalaiLama had 2,075,807 followers, having added over 6,000 followers since 7 p.m. Sunday. Tibetan struggle highlighted – Thubten Samphel, a spokesperson for the Tibetan government-in-exile, said, “The aim of His Holiness to join Twitter is to reach out to the followers. “The more important is to explain to Chinese youngsters about the nature of Tibetan struggle – not anti-China, not anti-Chinese, and just to fight it out with the wrong policies of the China government. In his tweets, he also preaches to Chinese scholars.” In his interactions, the Dalai Lama touches upon various topics concerning Tibetan exiles, Samphel added. US visit proved inspirational – According to a post on the Dalai Lama’s official website, he began tweeting soon after his meeting with US President Barack Obama at the White House (in February last year). During his US visit, the Tibetan spiritual leader met Twitter founder Evan Williams, who suggested he use the medium too. 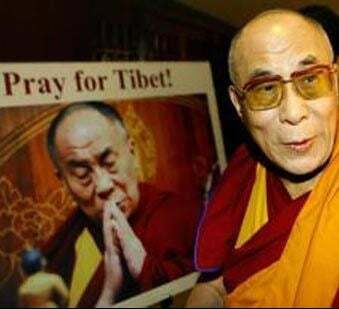 On Feb 22, 2010, Williams tweeted: “Met the Dalai Lama today in LA. Pitched him on using Twitter. He laughed.” Most of the Dalai Lama’s tweets link to webcasts on his official website where he talks about the life story of the Buddha.